Nothing says summertime like the flavours of the Mediterranean; small dishes filled with big flavour. And nothing says the Mediterranean like Abington Street in Northampton (bear with us; this is going somewhere). Okay sure, you may not associate the top of Abington Street with the essence of the Mediterranean, but after a visit to Nuovo you would be forgiven for confusing the two. So with the sun now beating down on Northampton, it seems like the perfect time to give the restaurant a review. Opening up in December 2014, the restaurant is the brainchild of restaurateurs Stewart and Sophie Wright, owners of the popular Papa Cinos. 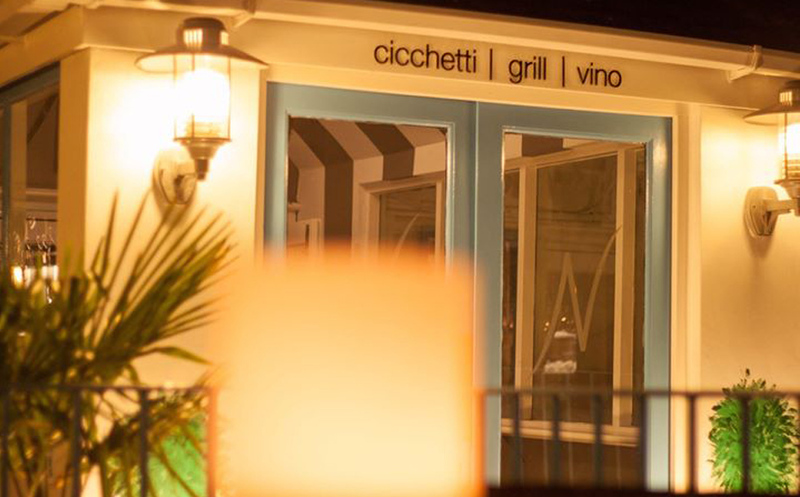 Together with head chef Matthew Taylor – the former maestro responsible for creating the culinary delights at the renowned Brabenecs –the restaurant has been making waves with their small, tasty cicchetti dishes and their impressive grill. 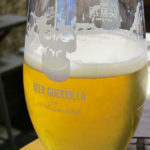 The restaurant has a large, open dining space with a raised stage area, where occasionally the restaurant hosts live music, as well as a well stocked bar filled with continental tipples. Inside, each furnishing brings a little bit of the Mediterranean to the restaurant, with white and blue drapes reminiscent of the French Riviera and artwork which injects elements of Greece and Italy. Like a Spanish seafront tapas bar, Nuovo also offers a pleasant alfresco dining area for diners to enjoy a meal and soak up some sun. We won’t go as far as saying that you can feel the breeze from the Mediterranean Sea when you close your eyes; but with olive trees, palms and herbs around the furniture, you are certainly transported away from the bustle of Abington Street. The menu at Nuovo offers a varied selection of small plates, known as cicchetti – a Venetian term for small plates, which we are sure you knew already. 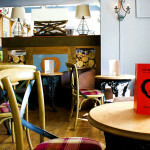 With such a wide choice of dishes, it is unlikely any gent will be left wanting. Priced around £3-8 per dish, the menu blends authentic Italian dishes with Spanish, Greek and Portuguese influences, giving lots of flavours, textures and styles. The tapas like dishes are made for sharing and experimenting, making Nuovo an ideal date destination. 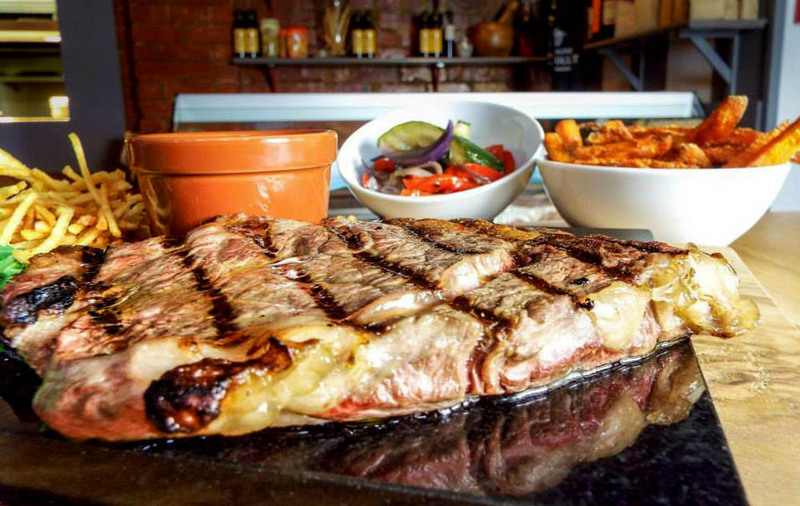 The restaurant also has platters and an impressive grill menu, where head chef Matt serves up a delicious array of meats cooked on the Tuscan Forno-Grill. Diving into the menu, we opted for the crispy polenta panzanella (£4.00) and deep fried monkfish (£5.00). The crispy polenta panzanella with risotto rice balls, peas and mozzarella had a nice crunch but were slightly stodgy; fortunately the sharp tomato sauce helped cut through the heaviness. The deep fried monkfish however was a revelation. Wonderfully delicate monkfish housed inside a light and crispy batter worked well with the cool aioli with a hint of heat from the chilli. All in all, a triumph. Being the carnivorous gentlemen that we are, the rib platter (£25.00) screamed out at us. 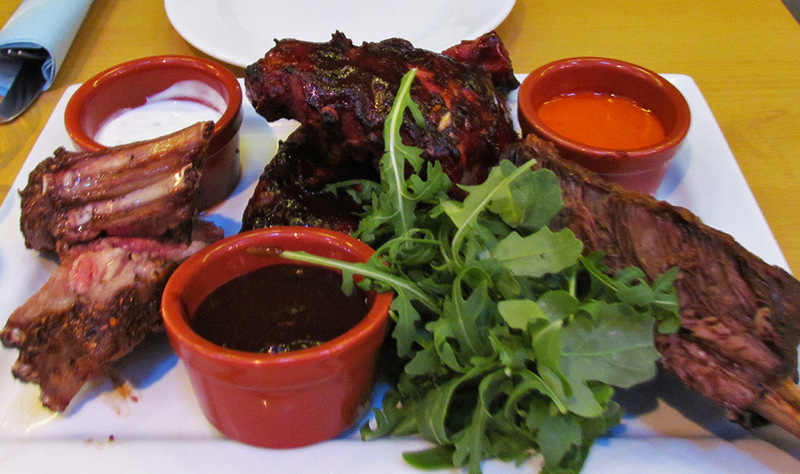 A veritable feast of meat on a platter, the dish is comprised of the ribs of three different animals; lamb, pork and beef. Sticky, sweet, juicy and falling off the bone, the ribs were delicious. If you do take a date, we would recommend against ordering it – the ribs get unavoidably messy. Accompanied with three sauces – harrisa, yogurt and balsamic glaze – it is impossible not to throw caution and cutlery to wind and tuck in. The harrisa sauce is particularly impressive; fresh, aromatic and full of flavour without being too spicy. With sweet potato fries to help break up the mountain of meat, it is safe to say we were not left wanting. A colourful bar plays host to a number of wines from around the Mediterranean, with a Dolcetto or Verdejo for £3 a glass or an extensive cellar list filled with Spanish and Italian vino ranging from £24 to £110 a bottle. We washed everything down with a bottle of Dolcetto d’Ovada; deep, red and soft, each sip slowly carried us away into an Italian countryside. 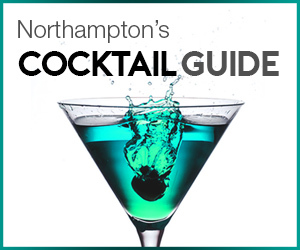 Such a charming slice of the warmer continent nestled away in Northampton is a welcome gem to the town centre’s culinary offering. It is not just the food and setting that make Nuovo stand out. In particular, the deli counter deserves special mention. Cured meats, cheese, Nuovo’s own breads and more which are all used in their kitchen will soon be available for gents to take home. With the restaurant being one of the host venues for the Northampton Music Festival this year, as well as running Rhythm and Ribs Thursday, Grazin’ on a Sunday Afternoon, it seems Nuovo is intent on finding interesting ways to bring a slice of the Mediterranean to Northampton’s gents. Gent tip: Look out for a pop-up version of Nuovo and the Independent Retailers Exhibition at the Guildhall 4th July. Our suggestion is even simpler; sit, laugh, eat, drink and enjoy Nuovo’s relaxed Mediterranean charm.